Host cell factors play a critical role in the establishment and maintenance of Kaposi's sarcoma (KS). We outline methods to identify host cell factors altered in KSHV-infected DMVEC cells, and in KS tumor tissue. Cellular genes altered by virus will serve as potential target(s) for novel therapeutics. Alcendor, D., Knobel, S. Identifying Dysregulated Genes Induced by Kaposi's Sarcoma-associated Herpesvirus (KSHV). J. Vis. Exp. (43), e2078, doi:10.3791/2078 (2010). Currently KS is the most predominant HIV/AIDS related malignancy in Southern Africa and hence the world.1,2 It is characterized as an angioproliferative tumor of vascular endothelial cells and produces rare B cell lymphoproliferative diseases in the form of pleural effusion lymphomas (PEL) and some forms of multicentric Castleman's disease.3-5 Only 1-5% of cells in KS lesions actively support lytic replication of Kaposi's sarcoma-associated herpesvirus (KSHV), the etiological agent associated with KS, and it is clear that cellular factors must interact with viral factors in the process of oncogenesis and tumor progression.6,7 Identifying novel host-factor determinants which contribute to KS pathology is essential for developing prognostic markers for tumor progression and metastasis as well as for developing novel therapeutics for the treatment of KS.8 The accompanying video details the methods we use to identify host cell gene expression programs altered in dermal microvascular endothelial cells (DMVEC) after KSHV infection and in KS tumor tissue.9 Once dysregulated genes are identified by microarray analysis, changes in protein expression are confirmed by immunoblot and dual labeled immunofluorescence. Changes in transcriptional expression of dysregulated genes are confirmed in vitro by quantitative real-time polymerase chain reaction (qRT-PCR). Validation of in vitro findings using archival KS tumor tissue is also performed by dual labeled immunochemistry and tissue microarrays.8,10 Our approach to identifying dysregulated genes in the KS tumor tissue microenvironment will allow the development of in vitro and subsequently in vivo model systems for discovery and evaluation of potential novel therapeutic for the treatment of KS. The BCBL-1 cell line, originally isolated from a human body cavity based lymphoma, is cultured in complete RPMI 1640 media (Gibco, Grand Island, NY). BCBL-1 cells are removed from liquid nitrogen, transported on dry ice, and quickly thawed for 1 minute at 37°C. A 50 μL aliquot of BCBL-1 cells at a density 1x104 cells/ mL is added to 500 mL of RPMI 1640 media supplemented with 10% fetal calf serum, 1x penicillin/streptomycin and distributed into 175 cm flasks, at 50 mL/flask. The flasks of BCBL-1 cells are then incubated at 37°C in an atmosphere of 5% CO2 until the cell density reached 3x106 cells/ mL. Lytic cycle virus replication is induced by adding TPA at 20ng/ mL and sodium butyrate at 0.3 ng/ mL. Twenty-four hours post induction cells are washed twice in PBS pH7.4 in a volume of 40 mL by centrifugation at 1500 rpm in a Sorvall Legend RT centrifuge (to remove butyrate), and induction is continued with TPA at 20 ng/ mL in RPMI 1640 for 5 more days. Cell free virus is isolated and concentrated by differential centrifugation. Briefly, cells and cell debris are first pelleted at 10,000 rpm in a Sorvall RC-6 Plus centrifuge at 4°C for 30 minutes. Supernatant containing the virus is removed and cell free virus pelleted in a Beckman Coulter Optima L-90K ultracentrifuge at 4°C for 1 hour at 25,000 rpm. The virus-free supernatant is removed and the viral pellet resuspended in freezing media (10% dimethyl sulfoxide and 90% fetal calf serum) and stored at -80°C until needed. KSHV infection of primary DMVEC cells. DMVEC cells at passage level 2-5 are plated at an initial density of 1 X 105 in 100x20mm tissue culture dishes or chamber slides, and are maintained in complete EMB-2 media (Lonza, Basel, Switzerland) at 37°C in an atmosphere of 5% CO2. At 80% confluence, DMVEC are infected at a moi of .01; mock infected (media only) cells are used as controls. Fresh media is added to cells every 2 days. DMVEC cell monolayers and chamber slides are examined daily for evidence of infection as noted by spindle cell formation. After the first sign of spindle cell formation (7-14 days) we discontinue media changes. However, longer incubation times in excess of 15-21 days without providing fresh media can compromise the integrity of DMVEC cells resulting in cells dying or lifting off the culture dish. At the point of maximal spindling during infection, cell monolayers are harvested for the preparation of cell pellets for protein or RNA extraction. Infected DMVEC cells on chamber slides are washed twice with 1 mL/window with pre-warmed PBS pH 7.4. Cells on chamber slides are harvested after washing 2X with PBS pH 7.4. Allowed them to dry completely before removing the chambers and placing the slides in 100% methanol held at -20°C until needed for immunofluorescent staining (IFA). Total RNA is extracted from KSHV-infected DMVEC and mock infected cells using a Qiagen RNesay Mini KIT (Qiagen, Valencia, CA). The manufacturer's protocol for processing animal tissue is employed but without the homogenization steps, if cultured cells are the source used for RNA isolation. Select the option offered to treat the RNA with DNAseI on the column using the Qiagen RNA free DNAse Kit, according to the manufacturer's recommendations located in the Appendix of the instruction manual. DNAaseI degrades any contaminating genomic or viral DNA from the RNA preparation. The DNAseI treatment is critical for down stream applications including RT-PCR, qRT-PCR and microarray analyses. The RNA is washed according to the instructions and any residual ethanol in the wash buffer is removed by centrifuging the column one more time than suggested by the manufacturer. Residual ethanol compromises the purity of the RNA after elution. After the final wash an additional centrifugation step is performed before the RNA can be eluted from the column. The RNA is eluted from the column with 30 μL of RNAse free water. The RNA is then quantified and analyzed for purity on an Eppendorf AG-6131 Bio-Photometer. The optical density ratio (260/280 nm) should be between1.8-2.0 which is typical for RNA of high purity. For microarray analysis, the RNA is analyzed on a Agilent 2100 Bioanalyzer using the RIN software algorithm. The analysis on the bioanalyzer provides you with a RNA Integrity Number (RIN) from 1-10, however RIN numbers from 7-10 have proven to yield consistent and more reliable results for microarray or qRT-PCR analyses. The average RIN number for RNA isolated with the Qiagen RNAeasy kit in our hands ranges from 7.5-9. Quantitation of RNA is achieved by adding 1 μL of the eluted RNA from the column to 99 μL of 10mM Tris-EDTA pH 7.6. The RNA and buffer is mixed with a pipette and added to a clean cuvette for spectrophotometric analysis with an Eppendorf Bio-Photometer. Messenger RNA in one microgram of each sample is primed using random hexamers provided by the manufacturer, prior to reverse transcription with a High Capacity cDNA reverse transcription kit (Applied Biosystems, Foster City, CA.). To synthesize single stranded cDNA from total RNA we use a High-Capacity cDNA Reverse Transcription Kit from Applied Biosystems and proceed according to the manufacturer's instructions. A 2x master mix of reagents is made and 0.5 to 1 μg of RNA in a volume of 10 μL is added to 10 μL of the 2x master reagent mix. The resulting 1x solution is gently mixed and reverse transcription is performed in a BIORAD MJ Mini-themal cycler according to the manufacturer's instructions. Up to two micrograms of total RNA can be used per 20 μL reaction. The cDNA is quantitated at 260 nm in an Eppendorf AG-6131 Bio-Photometer, and stored at -80°C until needed for qRT-PCR. Our laboratory performs microarray analysis at the Vanderbilt University Medical Center Microarray Shared Resource Core Facility on a fee-for-service basis. We compare output files for transcriptional dysregulation of genes in KSHV infected DMVEC cells to mock infected control cells. Transcriptional dysregulated genes in KSHV infected cells that are relevant to angiogenesis, cell proliferation or that represent metastatic biomarkers are validated in vitro using KSHV infected DMVEC cells using real time PCR, Western blots, and dual IFA; results are compared to findings in archival KS tumor tissue. Real Time PCR is performed in 96 well optical plates (Sorenson Bioscience, Inc.) using reverse transcriptase generated cDNA originating from a purified RNA sample and using a MyiQ Single Color Real Time PCR Detection System (Bio-Rad Laboratories, Hercules, CA) and 25 μL reaction volumes. This procedure is done in a biological safety cabinet to avoid possible contamination by extraneous DNA/cDNA that might be present in the room. A master mix is prepared in 1.5 mL tubes for each primer set (according to the manufacturer's instructions) using SYBR Green Supermix (Bio-Rad Laboratories, Hercules, CA) and selected forward and reverse primers for each gene of interest, at a concentration of 250 nM per well, made in RNAase DNAase free H2O. Each sample should be done in triplicate. Primer sequences for qRT-PCR for host cell genes include primer sequences for KSHV LANA, which is the virus latency associated nuclear antigen that is highly expressed in KSHV infected DMVEC cells and KS tumors. The 10 ng/ul stock cDNAs from mock infected and KSHV infected DMVEC cells are diluted 1:3 using RNAase DNAase free H2O; 3μL of this dilution is added to each well. Control wells substitute water for cDNA. The 96 well plate is sealed with optical sealing tape (Bio-Rad Laboratories), gently mixed and centrifuged for 2 minutes at 1000 rpm, room temperature, to collect the reaction mixture at the bottom of the wells. The Bio-Rad MyiQ Detection System and the lamp is turned on at this time to allow for a 10 minute warm-up period before starting the run. The centrifuged 96 well plate is then put into a Bio-Rad M iQ Single Color Real Time PCR Detection System, the program of cycle sequences entered and saved, and the run started. The cycling sequence is as follows: 95°C for 3 minutes, 95°C for 15 seconds, 60°C for 1 minute, 95°C for 1 minute, 55°C for 1 minute, and 55°C for 30 seconds for 81 cycles total. A melt curve is included in this program as a check for primer efficiency. A GAPDH primer set is amplified, and included for normalization. Data analysis is done with the Bio-Rad iQ5 Optical System Software Version 2. Chamber slides (removed from chambers) containing both confluent infected and uninfected DMVEC are washed twice with PBS pH 7.4, air dried, and fixed in -20°C pre-chilled absolute methanol for 10 minutes and held at -20°C. Slides with cells are then air dried for 15 minutes, and placed into a Coplin jar on ice containing Tris saline (0.05M Tris pH 7.4) for 5 minutes. Cells are then incubated for 1 hour at 37°C in a humidified chamber with a mixture of monoclonal antibodies to KSHV LANA at a 1:50 dilution in PBS pH 7.4 (Vector Laboratories, Burlingame, CA) plus a goat polyclonal antibody (1:100 dilution in PBS pH 7.4) against the host factor protein found to be dyregulated by microarray using KSHV infected DMVEC cells. The cells are then washed 3x with Tris saline (never allow the cells to dry out) and then incubated for 30 minutes with a mixture of a secondary donkey anti-mouse IgG antibody conjugated with rhodamine red-X and donkey anti-goat antibody conjugated to FITC (Jackson ImmunoResearch, West Grove, PA), both at a 1:100 dilution in PBS. The cells are later washed 3x in Tris saline in a Coplin jar and while the slides are still damp, the slides are mounted with Vectashield mounting media (Vector Laboratories, Burlingame, CA) containing 1.5 g/ mL of DAPI and a coverslip. Fluorescence is observed and images photographed with a Nikon TE 2000S fluorescent microscope mounted with a charge-coupled device (CCD) camera. Photographs are taken using a 20x objective for a total magnification of 200x. Separate photographs at the same magnification used for DAPI (200x), are taken usinge UV illumination, with a green filter for rhodamine and a blue filter for FITC. The images are later merged using Nikon's freeware software. Dual labeled immunohistochemistry is performed with the DAKO strepavidin ABC duet staining kit for KSHV LANA and those host cell proteins found to altered after virus infection. IHC is performed on archival AIDS-KS tissue fixed in formalin, and embedded in paraffin. Five microns sections are cut with a microtome and placed on chemate slides prior to immunostaining. Paraffin embedded slides are deparaffinzed in xylene for 10 minutes under a fume hood, and then cells are hydrated in a graded ethanol series of 100%, 95%, and 70% for five minutes each. Slides are then placed in water for 10 minutes prior to antigen unmasking (also known as antigen retrieval). For immunostaining, antigen unmasking is performed in a microwave oven in 50 mM citrate pH 6.0 buffer at 95°C for 15 minutes. Briefly, slides containing cells are submerged in 95°C citrate buffer for 15 minutes, then immediately placed in distilled water held at room temperature. Quenching of endogenous peroxidase is performed by incubating slides for 30 minutes in a quenching solution. Briefly, add 47 mL of 95% ethanol to a 50 mL conical tube; add 11.2 mL PBS pH 7.4 and 1.8 mL of 3% hydrogen peroxide for a total of 60 mL. The quenching solution is made just prior to use. The cells are then washed 3x in PBS pH 7.4 for 5 minutes each at room temperature. A blocking solution (12.5 mL of 95% ethanol, 1.4 mL of normal goat serum, 140 mg bovine serum albumin, and 2 drops Tween 20) is prepared to prevent nonspecific binding of antibodies. Place on ice before use. (This blocking solution can be stored at 4°C and for up to 1 week). Blocking solution is added to the specimen on the slide and is then covered with a strip of paraffin (to avoid drying out of specimen) and placed in humidified chamber and incubated for 1 hour at room temperature. The primary monoclonal or polyclonal antibody to the viral antigen is prepared in blocking solution at a 1:50 dilution, mixed with a pipette and placed on ice until needed. Fifty to 100 μL of antibody solution will be needed per tissue specimen depending upon the size of the specimens and the number of slides. Immediately after incubation the blocking solution is shaken off the slide and 50-100 μL of the primary antibody is added to the tissue specimen which is then covered with a strip of paraffin. Specimens are incubated for 1-2 hours in a humidified chamber at room temperature. Slides containing specimens are then wash 3x for 5 minutes each in PBS pH 7.4 to which is added a secondary biotinylated goat anti-mouse antibody at a 1:100 dilution in PBS pH 7.4, and incubated in a humidified chamber at room temperature for 30-45 minutes. Approximately 30 minutes before using, the peroxidase conjugated-strepavidin in PBS pH 7.4 is prepared. Using the DAKO Cytomation Duet Kit, add 50 μL of solution A to 5 mL of PBS pH 7.4, vortex, and then add 50 μL of solution B and mix again. After the antibody incubation in step 6.10 in complete, the slides are washed 3x in PBS pH 7.4 and then the freshly prepared horseradish peroxidase conjugated-strepavidin solution is added and incubated at room temperature for 30-45 minutes in a humidified chamber. After incubation, slides are washed 3x in PBS pH 7.4 at room temperature. Five minutes before the washing is complete, the 3, 3-diamino-benzidine (DAB, SIGMA) substrate solution (20 mL of PBS pH 7.4, 25 μL of 3% hydrogen peroxide, and 1 DAB tablet) is prepared. After the DAB tablet is completely dissolved, the brownish colored solution is filtered through a 0.45 micron syringe filter. The filtered DAB solution is then added to the specimens after the final wash and color development for KSHV LANA in infected cells is observed in real time under brightfield illumination using a Nikon Eclipse E200 microscope. Once the desired color development is achieved, the reaction is quenched by incubation in distilled water for 5 minutes. The second labeling is achieved by an additional antigen retrieval step in the microwave as described above plus a second immunostaining with a monoclonal antibody to the cellular protein found to be dysregulated (Vector Laboratories, Burlingame, CA). Cells are subsequently washed, and then incubated with a biotinylated goat anti-mouse/rabbit IgG antibody (DAKO) at a 1:100 dilution followed by an alkaline phosphatase-strepavidin conjugate (Vector Labs, Burlingame, CA) at 1:500 dilution. Color development is achieved by incubating cells with the substrate vector red using a Vector Red alkaline phosphate substrate kit (Vector Laboratories, Burlingame, CA) according to the manufacturer's instructions. Counter staining, if desired, can be performed with orecin or hematoxylin. Tissue specimens are then permanently mounted with permount mounting media with a cover glass. Images are taken under brightfield illumination with a Nikon TE-2000S microscope mounted with a CCD camera. Normal DMVEC cells are cultivated in chamber slides at plating of density 2.5 X105 cells per chamber EBM-2 complete media. DMVEC cells are grown to 80% confluence (taking 3-5 days) after which 5 ul/chamber slide window of adenovirus expressing EGFP at a titer 1X 1010 particle/ mL. 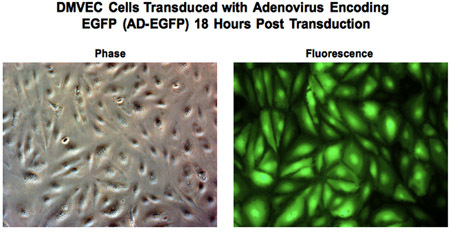 Live DMVEC cell cultures with Adenovirus added were examined for EGFP fluorescence 18 hours after adding the virus. Individual phase and fluorescent photographs were taken at a total magnification of 200X and merged on a NIKON TE 2000S fluorescent microscope mounted with a CCD camera. Figure 1. Primary DMVEC cells from Lonza Corporation were maintained in EBM-2 media and were infected with BCBL-1 virus at a moi of 0.01. After infection DMVEC cell monolayers were examined daily. Ten days post infection mock infected cells show a cobblestone-like morphology and KSHV infected cells exhibited a spindle cell type morphology characteristic of spindle shaped endothelial cells found infected with KSHV in KS tumor tissue. Photographs were taken with a NIKON TE 2000S microscope mounted with a CCD camera at a total magnification of 100X. Figure 2. Dual labeled indirect immunofluorescence staining was performed on KSHV infected DMVEC cells at 10 days post infection. 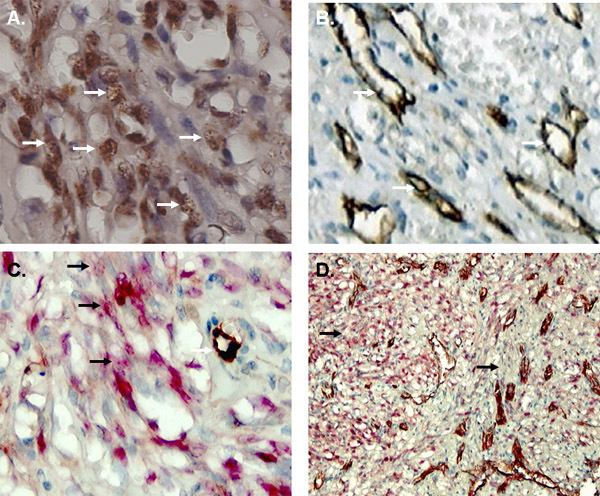 Infected cells were dual stained with a monoclonal antibody to KSHV LANA and a goat polyclonal antibody to a specific host cell protein found to be altered after KSHV infection. A mixture of secondary donkey anti-mouse and donkey anti-goat antibodies conjugated to rhodamine and FITC were added. Cells were examined with a Nikon TE2000S fluorescent microscope fitted with a CCD camera. Mounting media with DAPI was used to visualize nuclei. All photographs were taken at a total magnification of 200x. Infected cell expressing the virus LANA protein (rhodamine stained) localized to nucleus show reduced expression of the host cell specific protein (FITC stained) localized to cytoplasm. Figure 3. IHC in KS tumor tissue for LANA and PECAM-1/ CD31. AIDS KS tumor tissue was stained by single and dual labeled IHC for KSHV LANA and PECAM-1/CD31. A) Shows KS tissue stained with a monoclonal antibody to LANA and counterstained with hematoxylin. LANA positive cells are identified by white arrows. B). KS tissue stained with a monoclonal antibody to PECAMI/CD31 and staining appears specific to endothelial around vessels depicted by white arrows. C) Shows KS tissue dual stained for LANA (vector red) and CD31 (brown) depicted by black arrows for LANA a white for cells staining positive for CD31. D) Shows a lower magnification of an area from the same slide in panel C. Brightfield images were photographed on a NIKON TE2000S microscope at total magnification of 600x A-C and 200x for Panel D.
Figure 4. Temporal expression of KSHV LANA by qRT-PCR 10 days post infection compared to mock infected control cells. All values for KSHV infected DMVEC cells were normalized to GAPDH. There was no evidence of LANA cDNA amplification in mock infected cells. Figure 5. 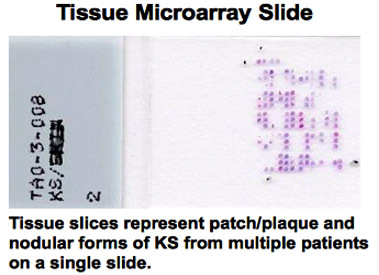 KS tumor tissue microarrays. The tissue microarray (TMA) represents 0.6 millimeter tissue cores arrayed on a single slide. Each tissue core represents a KS tumor specimen from a different patient. TMA were made available through the AIDS Cancer Specimen Resource (ASCR) from Leona Ayers M.D. at Ohio State University. Paraffin embedded KS tumor tissue along with matched normal and positive control tissues were placed on glass slides. KS tissue specimens were taken from mouth, skin, soft palate, tongue, and neck masses. All patients were HIV positive. Figure 6. Tissue microarrays were stained for KSHV LANA by immunohistochemistry and were analyzed by brightfield microscopy. Color development for LANA was performed with DAB as a peroxidase substrate and LANA positive cells were visualized by an intense brown staining pattern. Different amounts of viral burden and spindle cell regions can be observed. A) represents focal viral infection in defined region of the tumor. B) represents disseminated infection with a high viral burden that is roughly correlated with the number of spindle cells present. Stained tissue cores were observed at 200x magnification. Figure 7. DMVEC cells cultivated in EBM-2 complete media at a density of 2.5 X105 cells per well were transduced with 5 μL of Adenovirus at a titer of 1.0X1010. Cells were examined for EGFP fluorescence 18 hours post transduction. Both phase and fluorescent images were taken on a Nikon TE 2000S microscope at a total magnification of 200X. Transfection of primary DMVEC cells has proven to be problematic therefore we have identified viral vectors that will allow us to deliver fibulin-2 and galetin-3 very efficiently in primary DMVEC. We found that an adenovirus expressing EGFP can efficiently transduce primary DMVEC. We also found that the lentiviral vector we obtained from Lentigen Corporation was equally efficient for transducing primary DMVEC cells (data not shown). The methodologies used in this report can be performed in a variety of laboratory settings. They require some special equipment or access to core facilities. Proper precautions must be taken when doing experiments involving infectious viral pathogens like KSHV which may require the use of a biosaftey level 3 (BSL-3) facilities. Tissue acquisitions must also be approved by the appropriate institutional review boards (IRBs). These methodologies together can provide a basis for identifying genes that are dysregulated in expression in vitro and provide defined methods for in vivo validation of altered gene expression profiles as well strategies for gene delivery in endothelial cells. These findings taken together may help to elucidate biochemical pathways that are impacted by KSHV infection and subsequently by specific viral genes. An understanding of how oncogenic viruses like KSHV interrupt specific molecular pathways could provide insights in the development of novel therapeutics. We thank James E.K. Hildreth, Meharry Medical College, for his advice and review of this manuscript. We also thank Diana Marver for editing of the manuscript. This work was supported by the Meharry Vanderbilt Center for AIDS Research (NIH grant P30 AI054999-05); the Center for AIDS Health Disparities Research, NIH grant 5U54 RR019192-05; the Meharry Center for Clinical Research, NIH Grant P20RR011792; and by NIH grant P01 CA113239. D.J.A was partially funded by pilot grants from the Vanderbilt-Meharry Center for AIDS Research (CFAR) and the Meharry Center for Clinical Research (CRC). Sitas, F., Newton, R. Kaposi's sarcoma in South Africa. J Natl Cancer Inst Monogr. 28, 1-4 (2001). Moore, P. S., Chang, Y. Kaposi's sarcoma associated herpesvirus. Field's Virology. Knipe, D. M., Howley, P. M. Lippincott Williams and Wilkins. Philadelphia, PA. 2803-2833 (2002). Chang, Y., Cesarman, E., Pessin, M. S., Lee, F., Culpepper, J., Knowles, D. M., Moore, P. S. Identification of herpesvirus-like DNA sequences in AIDS-associated Kaposi's sarcoma. Science. 266, 1865-1869 (1994). Cesarman, E., Chang, Y., Moore, P., Said, J. W., Knowles, D. M., M, D. Kaposi's sarcoma-associated herpesvirus-like DNA sequences in AIDS-related body-cavity-based lymphomas. N Engl J Med. 18, 1186-1191 (1995). Cesarman, E., Knowles, D. M. Kaposi's sarcoma-associated herpesvirus: a lymphotropic human herpesvirus associated with Kaposi's sarcoma, primary effusion lymphoma, and multicentric Castleman's disease. Semin Diagn Pathol. 14, 54-66 (1997). Chiou, C. J., Poole, L. J., Kim, P. S., Ciufo, D. M., Cannon, J. S., ap Rhys, C. M., Alcendor, D. J., Zong, J. C., Ambinder, R. F., Hayward, G. S. Patterns of gene expression and a transactivation function exhibited by the vGCR (ORF74) chemokine receptor protein of Kaposi's sarcoma-associated herpesvirus. J Virol. 76, 3421-3439 (2002). Staskus, K. A., Zhong, W., Gebhard, K., Herndier, B., Wang, H., Renne, R., Beneke, J., Pudney, J., Anderson, D. J., Ganem, D., Haase, A. T., T, A. Kaposi's sarcoma-associated herpesvirus gene expression in endothelial (spindle) tumor cells. J Virol. 71, 715-719 (1997). Alcendor, D. J., Zhu, W. Q., Desai, P., Vigil, H. E., Hayward, G. S. KSHV downregulation of galectin-3 in kaposi's sarcoma. Glycobiology. (2009). Ciufo, D. M., Cannon, J. S., Poole, L. J., Wu, F. Y., Murray, P., Ambinder, R. F., Hayward, G. S. Spindle cell conversion by Kaposi's sarcoma-associated herpesvirus: formation of colonies and plaques with mixed lytic and latent gene expression in infected primary dermal microvascular endothelial cell cultures. J Virol. 75, 5614-5626 (2001). Long, E., Ilie, M., Hofman, V., Havet, K., Selva, E., Butori, C., Lacour, J. P., Nelson, A. M., Cathomas, G., Hofman, P. LANA-1, Bcl-2, Mcl-1 and HIF-1alpha protein expression in HIV-associated Kaposi sarcoma. Virchows Arch. 2, 159-170 (2009).